Grande Prairie Realtor®. If you are thinking of selling I will do a free no obligation market evaluation on your home, message me or call 780 380 8769 that's 780 380 TROY. 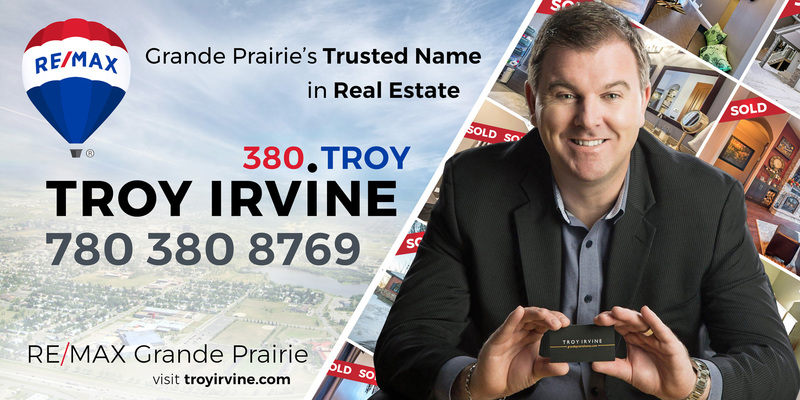 Team Troy Irvine is led by Troy - a full-time, licensed Realtor® who is a top performer in Grande Prairie when it comes to successfully closing real estate transactions, both residential and commercial. His deals are founded on 20 years of sales experience in the city and surrounding areas. Troy confidently guides his clients to the best deals, putting their interests first in every negotiation. For his clients, the result is a surprisingly smooth, decisive and enjoyable experience in buying or selling their home - whether it’s a young family with their first sale, or his repeat clients who deal extensively in real estate investing. To the Grande Prairie community, he’s well-known as a professionally confident agent and a refreshingly straight-to-the-point adviser, a local from way back who knows every corner of the city. He and his lovely family has ties with various communities in the city, an impressively diverse network that few other agents can match. Troy is a full-time, certified Realtor®, a top performing negotiatior who is specialized in helping people like you buy or sell residential homes in Grande Prairie. Maritoni is a Real Estate Assistant of many talents and connections, and she’s putting all of it to work for your home sale behind the scenes. That’s on top of being a Wellness Coach and a super mom, too. Kat is the very picture of a go-getter - plus she brings a positive energy to the all-new Team Troy Irvine. Looking forward to her achievements with the team! Dedicated family man and veteran Realtor with over a decade of experience, Trent brings in a ton of experience to Team Troy Irvine. I'm available 24/7 for arrangements or questions. Call me at 780 380 8769, reach me by Messenger via Facebook or email me at troy@gpremax.com.